France's run to the World Cup final is one of the most remarkable stories to originate from any of rugby's global gatherings. Fraught with in-fighting, moustaches, "spoilt brats" and anti-doping regulations, against all odds Marc Lievremont's men have the chance to return to Paris next week with the William Webb Ellis cup in their grasp. Ahead of Sunday's World Cup final with New Zealand, this week's Scrum Sevens looks back at a colourful, sometimes extraordinary and facial fuzz-filled campaign for Les Bleus. On the face of it, France had bounced back from their poor Six Nations campaign with back-to-back wins over Ireland in their two pre-World Cup warm-up Tests. However, behind the scenes things were far from straight forward. Bayonne winger Yoann Huget was named in Marc Lievremont's preliminary party for the World Cup and, after featuring prominently during the 2011 Six Nations, would have hoped for a place on the plane. But Huget was forced to withdraw from selection after failing to abide by anti-doping regulations. The winger was later hit with a three-month ban and whether he would have made the final squad is only known to Lievremont, but the event would have done little to lighten the mood in the French camp. 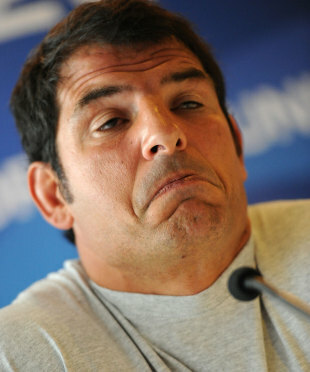 With Lievremont set to step down following the 2011 tournament, the French Rugby Federation (FFR) made a shambles of appointing his replacement. Philippe Saint-Andre was widely reported to be the man in waiting - much to the consternation of Toulon supremo Mourad Boudjellal. It was a press field-day as the FFR failed to make any official announcement and they were forced to concede that the former Sale boss was the man chosen to take the national side's reins just two days later - the timing of which was hardly ideal with a team attempting to focus on winning the sport's biggest prize. France opened their World Cup campaign with a 47-21 win over Japan - a scoreline which suggests a convincing performance but, in reality, France struggled. At one stage of the match, Japan pulled themselves back to within four points of France - thanks to the hugely impressive James Arlidge - but late tries from Lionel Nallet, Pascal Pape and Morgan Parra were enough to despatch the tiring Brave Blossoms. A clearly furious Lievremont laid the blame at the feet of some of his experienced charges, with Dimitri Yachvili, Imanol Harinordoquy and Francois Trinh-Duc all coming under the spotlight for performances which he deemed to be "lackadaisical". A disgruntled Yachvili sat in front of the press days later and reacted angrily to the criticism levelled at him by his coach, arguing that he would have preferred the feedback to have been relayed to him in private. He said: "It's a real pleasure, it's touching. No, I would prefer to be told directly rather than going through the press. He spoke out in anger. I probably deserved him saying it, or not. [But] I would rather it happened another way." After another unconvincing display against Canada - where France had Vincent Clerc to thank with a hat-trick to see them through - Lievremont opted to change his half-back partnership for the pool meeting with New Zealand, starting scrum-half Morgan Parra at fly-half alongside Yachvili. Up to this point, tension had been growing between the team, management and the press with Harinordoquy's defence of the selection a case in point. Arguing that the press were carrying out a "polemic" against the national side, Harinordoquy was adamant a side which was widely labelled a 'B Team' would front-up against the All Blacks. In reality, they talked the talk but failed to show any sort of strut against the New Zealanders, losing 37-17. After seeing his selection gamble backfire, Lievremont went on the offensive in the post-match press conference telling the media to "go to hell with your questions" and describing the atmosphere as "detestable." With rumours persisting that an uprising had occurred within the camp after their loss to the All Blacks, the evergreen Lionel Nallet was forced to reject such suggestions in an attempt to keep the peace. The lock described the rumours as "nonsense" and laughed at claims that 25 of the 30 men in the French squad did not want to play for Lievremont. Lying in wait for the French was Tonga - a side who had already lost to Canada in the pool stages. What followed was one of the biggest upsets in the history of the World Cup as the Islanders ran out 19-14 winners. Despite their loss, France still qualified for the knockout stages - a qualification which Lievremont described as "bitter." After the loss to Tonga, the French coach had hoped to close the ever growing chasm in the side with a few beers after the game. However, the team turned their back on their boss deciding to go their separate ways leaving a disconsolate Lievremont with an obnoxious number of beers and more questions to answer. "I would have liked for us to gather around a few drinks yesterday, to talk, to share thoughts, to tell each other that it's a beautiful adventure, all things considered," he said. "And I was disappointed. "At the end of the press conference, I got us some beers to release the pressure - and we all split in different directions. It's a kind of disappointment. For now, there is no divide in the group, even if it may look like it. I'm still waiting for some reaction from the players. It's their choice if they do." England were another side with their fair share of off-the-field strife and the pair met in the quarter-final of the World Cup. In a similar vein to Nallet, Yachvili stepped in front of the press pre-match to once again reiterate the party line that the group were united and there was no French revolution occurring. This followed Harinordoquy's admission that the team were unhappy with Lievremont's public criticism of the players after their loss to Tonga. And while all of this was going on, Lievremont had cultivated a pencil moustache in tribute to defence coach Dave Ellis and reportedly as a result of losing a bet to his brother. But against England, France finally found some form, storming into a 16-0 half-time lead thanks to the boot of Yachvili and clinical finishing from Vincent Clerc and Maxime Medard. And France closed the game out in the second-half despite a late fight back from England to prevail 19-12. Lievremont revelled in the moment after the match describing the victory as "emotional" and admitted he was pleased to see his side do "their part of the contract." Unlike their previous opponents England, France's semi-final challenger was one of the form sides of the World Cup. Wales had captured the imagination of the country with over 60,000 supporters cramped inside the Millennium Stadium to watch their exploits against France on a television screen. Wales were slight favourites but as watchers of international rugby will know, France are the perennial party-poopers when it comes to supposed 'destiny'. Despite an immense performance from France's defence - which saw them concede just one kickable penalty in the final stages of the match - the game will be remembered for a key moment in the 18th minute of the match when Alain Rolland dismissed Wales captain Sam Warburton for a 'tip-tackle' on Clerc. The incident will debated until the valleys in Wales cease to exist but France held on by the narrowest of margins to prevail 9-8. Despite failing to close out a 14-man Wales side, Lievremont was in a defiant mood post-match saying: "I don't care at all whether it was a good match or not, whether the Welsh deserve to be in the final, we have qualified for the final and that's all that counts. They [Wales] have been amazingly brave but the French team might have a guardian angel." The win over Wales teed up a final with hosts New Zealand - a team known to Les Bleus following their earlier meeting. Despite the prospect of the biggest game of their lives, all was not well in the France camp with Lievremont once again speaking out after his players disobeyed his wish to stay off the beers after their semi-final win. What followed was a bizarre torrent of abuse aimed at ais side in which Lievremont said: "I told them they are a bunch of spoiled brats. Undisciplined, disobedient, sometimes selfish. Always complaining. And it's been like this for four years. But at the same time we're in the final. And as I said yesterday we have to believe in this destiny." Lievremont was left to rue his outburst saying days later: "I should have kept my big fat mouth shut when I saw myself quoted all over the front pages of the written press." And in one of their final press-conferences prior to the final, there was another bizarre display of player disobedience as Aurelien Rougerie stormed out, labelling the questions "bland" with Lionel Nallet left to hold the fort. Despite the off-the-field strife and inconsistency of their performance on the pitch, France can still yet walk away with the sport's biggest prize. And that is the paradox that has been at the crux of Lievremont's time in charge of Les Bleus.